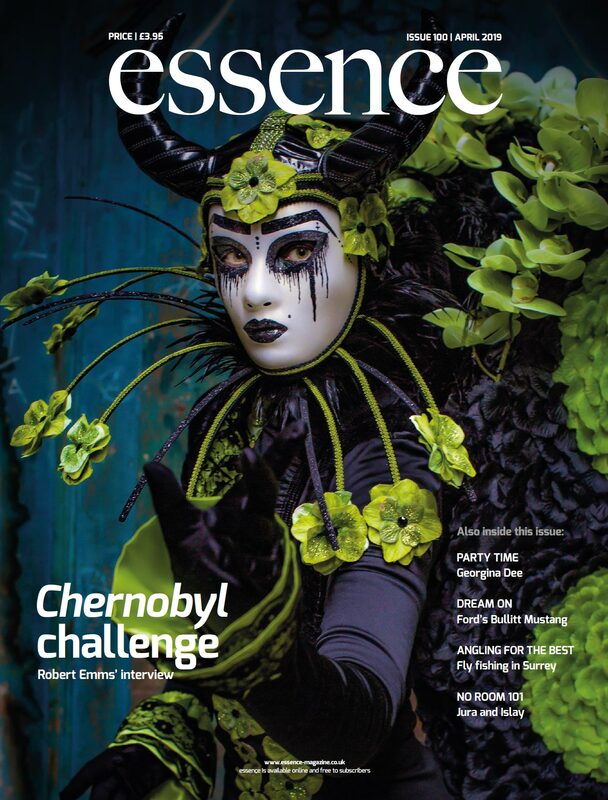 Tetyana Kovalenko is the multilingual founder and CEO of Elite Stone, a luxury manufacturer of ornamental stone used in many exclusive interiors. Andrew Peters asked her about her company and her passion for using stone. Q Tetyana, after studying psychology, you went on to study geology and mineralogy at Rome University. What attracted you to the subject? A When I started to work for a company producing equipment for quarries, I was determined to become a true professional. I took a graduate course in geology in order to understand every aspect of natural ornamental stone, both chemical and physical. During the course of intense study, my fascination with marble and onyx, as well as quartzite, grew stronger than ever. Q Who inspired you and continues to do so? A I am devoted to luxury and beautiful things, inspired by changing trends in fashion and interior design. Outside our buildings in Verona we have installed a profile of Michelangelo’s David carved in Carrara marble. Q Can you tell us about Elite Stone and why you started the company? A I have always had the ‘gout de luxe’ (marble has, since ancient times, been associated with glamour, wealth and power). I understood that bespoke design is now de rigueur for those in search of the ‘best of the best’ with gleaming surfaces impeccably crafted in natural stone. The first Elite showroom opened in Rome in 2000, moved to Carrara in 2007 where the company has strong associations with local quarries, and finally established in Verona in 2013. Q In which countries does Elite now work? A The UK, US, Russia, Israel, the Middle East and Europe are our main markets. Q Do you work for both private and commercial clients? A Yes, we do, and provide each with the same amount of personal attention and service. Q The company has recently completed some very high-end projects in the UK. Is it your intention to expand here? A Of course, we have opened our new showroom to demonstrate to clients the creative potential of marble. Q How does the company push boundaries in the traditional use of natural stone? A Elite Stone invests in research to explore new ways of using marble. One example is in the use of extra thin stone for lining doors, showers, backlit tabletops and panelling. We have a technical department dedicated to solving what are complex technical problems. Q Which quarries supply the stone used? A Mainly quarries in Carrara: Calacatta Borghini, Statuario, Calacatta Vaglia and Caldia. We also import from other countries, including Mexico and India; wherever we can source superb quality stone. Q What are the key factors when working on a project to produce a result satisfying to the client? A Discover and understand the client’s personal vision, suggest the right stone for its purpose and ensure each project is meticulously executed. Q What is the best advice you can provide to a client contemplating using natural stone? A To appoint experienced people with technical expertise who are aware of subtle differences in stone, beyond just good looks. Kitchens, bathrooms, external surfaces: each area needs an individual approach. Q What is the E-Light System your company has developed? A E-Light is a system of backlighting panels of marble and onyx, developed over ten years by Elite Stone’s technical team. This idea offers endless decorative possibilities to highlight the beauty of natural marble and onyx, far beyond a tabletop or bathroom wall. The E-Light panel is a laminated element, compact, lightweight and durable, with a minimum thickness of six millimetres, formed by a rigid glass support a minimum of three millimetres thick, coupled to a panel in natural marble of three millimetres, or onyx of five millimetres. Each panel can be backlit by a bright LED light transmission system provided by two methods: either dimmable white light or an alternative system offering a choice of 16 colours. The tempering of the rigid glass support procedure amplifies the physical and mechanical characteristics of normal glass by up to eight times. Q Do you have a favourite stone? A Whites, Calacatta and Statuario are considered the most ‘evergreen’ and elegant types of marble. I believe there is no ugly stone, only ugly installation. Q What has been the highlight of your career so far? A Creating a new type of stone business where the client is looked after throughout the sale and installation processes. To be able to offer an outstanding choice of materials and design, and contribute to some of the finest interior projects around the world. Q What projects does the company have in the pipeline? A We have a real variety, including completing 50 St James’ Hotel in London, villas in Como and Majorca, and a spectacular synagogue in Jerusalem. “True luxury is all about outstanding raw materials and an in-depth knowledge of how to work with them. Marble is like a diamond: absolutely perfect when the colour is right, when it is flawless and cut properly. Elite Stone recently completed a sumptuous basement conversion for a Surrey client. The basement spa was specially constructed and comprised an indoor pool, gymnasium, Jacuzzi, sauna and Turkish bath (Hammam) looking out over a Zen garden. Materials for the ensuite bathroom were Paonazzo marble on the wall and floor bespoke Cremo Delicato inlaid with Tuscan oak tiles. Different craftsmanship skills were required for cutting and fitting the different marble types. The ‘book match system’, the outstanding decorative feature, is very difficult to achieve and was constructed in four sections. The shower wall was clad in Tigers’ Eye, a semi-precious stone, and the spa mosaic uses stone supplied from Noir St Laurent and Pallisandro. 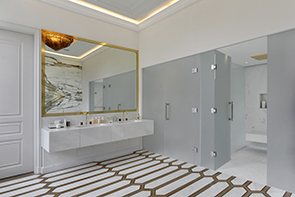 Using light, reflective surfaces, achieved with the use of individually selected white ‘book matched’ marble, the team at Elite achieved a cool, contemporary and spacious feel for the ensuite. 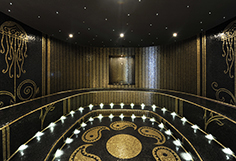 The spa and pool area had the opposite effect by using a black and gold mosaic tiling to line the pool with underwater creatures, such as jellyfish, picked out with gold tiling. The effect was completed with a stretched ‘black fabric’ ceiling. The ‘black’ effect interacted with the dramatic ‘green' of the newly-created Zen Garden viewed through a large picture window at the end of the pool.